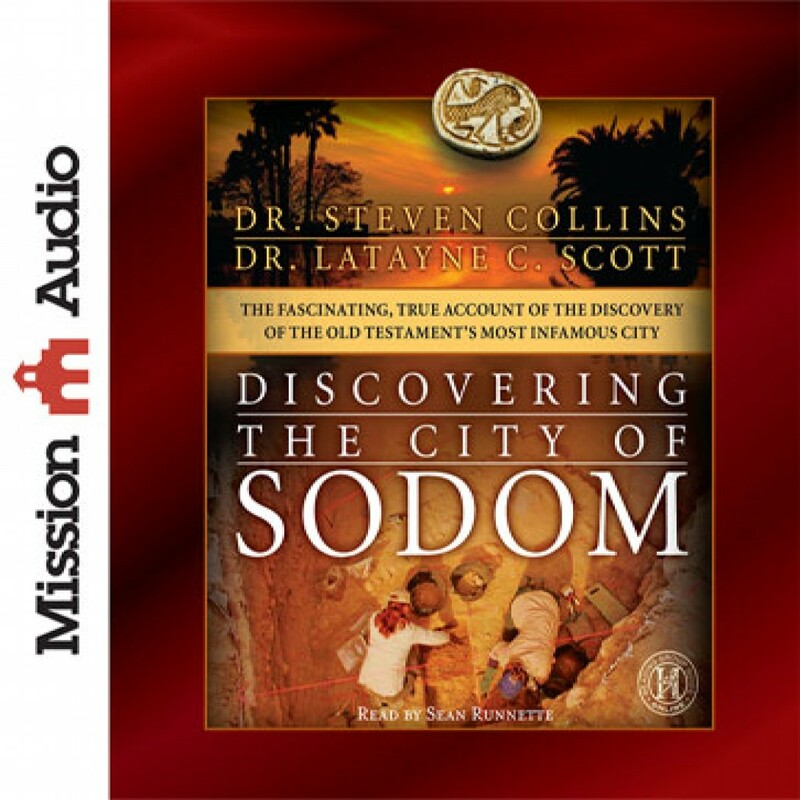 Discovering the City of Sodom by Dr. Steven Collins & Dr. Latayne C. Scott Audiobook Download - Christian audiobooks. Try us free. Is Biblical Archaeology Helpful to Faith? When I was living with my grandpa, one of our monthly traditions was to go to a local meeting of the Biblical Archaeology Society. I long have had interest in archaeological findings, as I think it provides a richness and context to a variety of historical narratives. So getting the opportunity to review Discovering the City of Sodom: The Fascinating, True Account of the Discovery of the Old Testament's Most Infamous City was exciting. The explanations as to why Tall el-Hammam made sense as biblical Sodom was where more of my interest re-arose. Hearing about the historical context and how archaeology can help us better interpret the Bible is helpful. I also really appreciated how Collins ended his book addressing the various critiques of his work. Some arguments center around whether a biblical Sodom ever truly existed while others debate biblical interpretation. Collins' biblical interpretation centers around a theory of true narrative representation. While I won't claim to fully understand this approach, I think it makes a few too many assumptions demanding the historicity of the biblical texts. I see it being driven more from a perspective of people's faith needing the Bible to be historically true than honestly approaching the texts and how they were meant to be read. This doesn't mean they are not historically true. I don't see any need for the story of Sodom to be historically true. However, I think those who deny archaeological data supporting biblical Sodom's historicity due to their interpretations of the Bible aren't being fair or honest, either. While I am most definitely not even a novice or amateur at reviewing archaeological material, Collins' arguments make sense to me. His willingness to engage in debate and address disagreement lends credibility. He does seem to want to be academically honest with himself and others. I grew up loving the Indiana Jones movies. I appreciated the action married with interesting (pseudo-) facts about history. I probably wanted to be an archaeologist once before I realized it involves a lot more digging and cataloging than swinging and shooting. I’d never read a book on biblical archaeology—or any archaeology for that matter—until I read Discovering the City of Sodom by Dr. Steven Collins and Dr. Latayne C. Scott. I thought it may be boring, having left the Indy dreams behind. I was mistaken. This book immediately drew me in and took me on an adventure. A true adventure. A current, modern adventure. I was reminded that, even in the 2010’s, there are stories the dirt has yet to tell. There is more evidence for the validity of scripture that has yet to be found. There is a framing narrative telling the story of “Dr. C,” an archaeologist and Near East tour guide who is beginning to believe that everything he has been taught about the location of Sodom is wrong. This frame story unfolds like a fictional narrative, but is meant to reflect Collin’s own very similar experience. This story is broken up by accounts of Collins and his team setting out to find the real Sodom by doing something that seems like a no-brainer: starting with the Genesis account of the destruction of Sodom and going from there. Collins and Scott use an unprecedented combination of archaeology, geography, linguistics, mathematics, forensics, chemistry, and exegesis to all but prove that Tall el-Hammam, located northeast of the Dead Sea the kikkar of the Jordan is the Sodom of the Bible. It’s a fascinating read, probably even for those who don’t read books about biblical archaeology or history—people like me. Discovering the City of Sodom is aimed enough at a popular level that it works as a kind of primer on biblical archaeology. It sent me looking for more information on the excavation of other biblical cities. Even though our faith isn’t solely dependent on the evidence unearthed by archaeologists, it’s nice to know that the historicity of the Bible is consistently reinforced by these discoveries. One section I really appreciated was the authors’ admonition of the Bible scholar to always take the Bible authoritatively, but not necessarily always literally. What a great takeaway! Sean Runnette does a great job on the narration, especially with a book that has so many difficult-to-pronounce place names. I highly recommend this book! Discovering the City of Sodom by Dr. Steven Collins and Dr. Latayne C. Scott is a very long but interesting account of the likely discovery of the ruins of the Biblical city of Sodom. It outlines the theories behind the discovery, the opposing theories of where Sodom was thought to be, the attempts to find it and the probable discovery of Sodom. The background and history of the city of Sodom and the kikkar of the Jordan is outlined in great detail along with the various theories of where the ruins of the city would be as determined by well known archaeologists. The journey to finding the city with highs and lows is presented in great detail to show the process that was endured for the end result. I found this quite an interesting book especially the history of the area over the last few thousand years and the eventual discovery of the city of Sodom. It is a probably a bit too long for a casual reader of the subject but quite an exciting discovery that I am glad I have heard about. The narration was rather good but the topic of the book at times can get a bit dry which didn't really help the listening experience but overall it was good. This book would be a great book for anyone interested in archaeology or finding evidence of Biblical places in the world. When I first read the subtitle for Discovering the City of Sodom: The Fascinating, True Account of the Discovery of the Old Testament’s Most Infamous City, I seriously doubted that any book about Biblical archeology could possibly deliver such a promise. I am not disappointed to report that my doubt was unfounded. Authors Dr. Steven Collins and Dr. Latayne C. Scott deliver a stirring tale of the discovery of this infamous city that is easily understandable by a noob like me, but that I believe is also detailed enough to keep a more knowledgable reader interested. The book includes enthralling narratives of the expedition to find Sodom, extensive Biblical context, and fascinating explanations about topics such as Biblical dating, including competing theories, to give context for understanding the issues involved in finding and verifying the true location of Sodom. I listened to the audiobook and many times discovered that my trip was over but I didn’t want to stop listening. Speaking of the audiobook, narrator Sean Runnette provided an exceptional narration that made the already fascinating book truly engaging. I recommend this audiobook for any Christian who is interested in learning more about Biblical archeology and how a team of archeologists is challenging the firmly held beliefs of academics around the world. I chose to listen to this book since I thought it'd be interesting to learn what life was like in the Biblical city of Sodom. As a result of this, I was disappointed with the book. However, what the book does do, it does well. What does this book focus on? Mostly, on the physical location of where the author believes Biblical Sodom lays. Hint, not below the Dead Sea. A whole book trying to prove the location of an ancient city?! Well kind of, but not quite. This is a great book to support (as if it needed any) the biblical account of Sodem and Gomorrah being literally destroyed by God. Near the beginning of the book they start a story about archeologists, than neglect this story for the bulk of the book, coming back to it in the end. It's not the most brilliantly pulled off, and I wish they could've done it better – it would've made the book less tedious for me. It seems like a weak attempt to breathe some life into the pages. The book seems very well researched. Very informative. However, assuming this is a scholarly work meant to be accessible for non-scholars I'm giving it 3/5 stars due to the presentation not being more captivating. Any book with the title "Discovering the City of Sodom: The Fascinating, True Account of the Discovery of the Old Testament’s Most Infamous City" promises to be a sensational read. But a book about discovering the biblical city of Sodom must surely be just another crackpot’s wild theory, right? Wrong. Dr. Steven Collins is a veteran archeologist and he has plenty to say against the crackpots and misguided adventurers whose escapades in the Middle East pose as archeological discoveries. And while his claim that Sodom has been found is controversial, he does his best not to be overly sensational and claim more than the evidence warrants. Collins is not without his skeptics, but the case he builds, I believe, is painstakingly thorough, and in the end convincing. I listened to an audio version of this book, read by Sean Runnette, available at ChristianAudio.com. And even without pictures and maps, I was enthralled by the tale. Collins, with the help of co-writer Latayne Scott, a professional writer, uses a variety of literary technicques to make a nearly decade-long project of digging holes in the sand sound interesting and engaging. He walks us through a day in a typical dig, describing the personality types and theological motives (or lack thereof) that people bring to such an undertaking. He uses flashback and personal anecdote, and then puts on his teacher’s hat as he assembles facts about archeology, dating, and the history of the Levant (the archeological term for Palestine). I was struck by Collins’ faith, and how he is unashamed to use the Bible as a souce alongside other ancient Near Eastern texts, in his scientific method. And with the Bible being the sole historical record of the city of Sodom, Collins surveys in detail the various aspects of the Biblical record and applies that to his research. His attention to the text with its many geographical details, ultimately is what convinces me that Tall el Hammam in modern-day Jordan, is the site of the biblical Sodom. Collins makes a convincing argument that Sodom and its sister city Gomorrah was located on the Kikkar, a plain near the Jordan river just to the north of the Dead Sea. And while he doesn’t find mysterious sulfer balls of the kind that lead to wild tales of supposed discovery, he does find an area bereft of any human civilization for 700 years after a sudden fiery end to what was a prominent culture. There are problems and puzzling sides to his story, however. He defends a date which will not fit with an early date for the Exodus. Anyone familiar with OT evangelical theology should know that the question of dating the Exodus is not as simple as it may seem. Collins dates the fall of Sodom to around 1650 B.C. Now with some work, his date could fit with a late date for the Exodus, as accepted by many scholars. However his own advocacy of a middle date for the Exodus, based on historical synchronisms with the text makes the problem even thornier for Collins himself. In the context of his grappling with the chronology of his finds, he makes what I believe is an important observation. And in this particular case, I believe he may well be right. Whether one agrees with his take on biblical chronology or not, you will have to grapple with the impressive geographical evidence that Collins marshalls from the text. It is clear that he respects and listens to the Bible’s text, and this very fact makes him a target of liberal scholars for his audacity to believe the Bible’s record could be true. By the end of the book it is clear that Collins isn’t out to make friends but to pursue the truth, and he believes his work has provided concrete evidence bolstering the belief that the Bible’s account of the destruction of Sodom is grounded in historical truth. Collins explains why others have not looked for Sodom in this locale. It is chiefly due to theories that Sodom was under the Dead Sea or to be found on its southern shores. Ultimately these theories were based less on evidence than on unsubstantiated educated guesses from earlier and still renowned biblical archeologists. Further data has contradicted the assumption that Sodom was in the barren wasteland of the southern Dead Sea – which was never (during the time of the Biblical sodom) an Edenic paradise that was to woo Lot to pitch his tent there. And the fact that the Dead Sea is at its lowest depth in the last four thousand years, aruges against the idea that the cities are to be found in its depths. The book ends with the most exciting find of all: pottery shards that are superheated to glass on one side, yet are perfectly normal pottery on the other. The conclusion of experts is that the shards were super heated and then cooled far too rapidly than would be expected by any typical human furnace or heating method known in ancient times. Extensive, independent research compares this to molten sand left over after nuclear experiments and the green glass found in the desert at times due to meteoric events. The best physical explanation is a meteor that burned up in the atmosphere leaving no crater, but still sending a fireball to earth (as in a documented case in Sieberia in the early 1900s). This may very well be concrete proof that the story of Sodom’s fiery demise as recounted in the Bible is true. Collins hesitates to say more than what science can affirm, but he holds the biblical record to be true by faith. Along the way he presents an excellent example of how to hold true to Scripture and yet still seek to pursue a path of valid scientific inquiry. The book reads well–mystery and history interwoven with the science of archeology. It will interest amateur archeologists and bible geeks, as well as history buffs. It can be understood by high schoolers as well and may spark an interest in biblical archeology in younger readers. The audio quality on the ChristianAudio.com recording was superb. Downloading the book in any format is a breeze. And the narrator does an excellent job keeping the story fresh and alive, rather than dull and boring. And kudos to him for pronouncing all the difficult words with ease. A simple search at Amazon will supply many of the charts and maps that are missing in the audio book experience. I am sure you’ll find the audio book as much fun as the hardback version. Of course, like me, you may be enticed to purchase both versions after listening to the audio reading of the book. A great book with some challenges to listeners. One of the great advantages of Discovering the City of Sodom was that not only did it take the topic of biblical archeology seriously, but it showed its audience how it went about doing this. Dr. Collins and Dr. Scott methodically explain the process of academic research and site excavation. This is of great advantage to the serious learner and provides their audience with confidence in the evidence that they present. This unfortunately is the Achilles heel of the audio version of this book since the acronyms abound and there is no quick reference chart to refer back to which the hardcopy likely has provided. Sean Runnette does an excellent job in his reading of the book. This is the first non-fiction book that I have heard him narrate, and he does a first-class job. He was, of course, clear and consistent in his speech which makes him a pleasure to listen to. He also has a very rich and dynamic way of presenting the characters in the narrative sections of the book. The one distracting thing was that the authors should have considered revising their book for an audio format. While abbreviations and acronyms smooth out reading, they become confounding when several are used together in an audiobook. Perhaps the most controversial part of the book was the sections presented in fictional format while supported with actual facts. Initially I liked this and assumed that it was used to smooth out the technical aspects of the book and add continuity to the book as a whole. As I got further into the book; however, this aspect became confusing and a little distracting. Alternately, I thought that this might have been done to provide anonymity for some of the people involved and research that had been done. Ultimately though, the book would have flowed fine without this contrivance and would prove more believable without the mixing of fiction and non-fiction. This was a great idea but, in the long run, unnecessary. Another boon/bane of the book was the biblical background information. I personally loved all the exploration of the Old Testament. The retelling of stories and examination of the text was a pleasure to listen to. This had the unfortunate side effect; however, of causing long lulls between the sections of scientific evidence given. I could see how this, coupled with the narrative sections, could frustrate some readers. Therefore this element is a mixed blessing. It helps the person with a weak knowledge of the Old Testament get a big picture of what’s going on, but it does go into more detail than is probably strictly necessary for a book like this. Whereas I enjoyed it (it felt like a science class and a Bible study happening at the same time) this will inevitably grate against the patience of some readers. At the end of the day, this is a book that all serious Christians should have. If for no other reason, this book is worthy of owning and listening to due to how it sets up and supports its position through empirical and provable facts. Too often, as Christians, we base our opinions on little more than what our pastors say or the literary cleverness of a popular author. This book, beyond everything else, is a careful, well thought-out examination of the history and location of the city of Sodom. Dr. Nicholson is a member of the christianaudio review program. To learn more, visit their website at: www.christianaudio.com. I admit the thought of listening to a book about the discovery of the ancient city of Sodom elicited a stifled yawn but two things kept me awake. I listened to the book traveling around 65 mph on Interstate 99 and it really is a fascinating book. It is not just a book about moving dirt and stones. It is a book that deals with knowing where the dirt is and what stones to move. In "Discovering the Lost City of Sodom" Dr. Steven Collins tells of his mission to find this city lost from view and how he went about it. Certainly one of the reasons the book kept my interest was because it was well written by Dr. Latayne Scott and the audiobook was well read in the christianaudio.com presentation. The book also reminds us that once we get an idea in our minds we often go with it instead of seeing if the idea fits the facts. In this regard I refer to the theory that Sodom was at the south end of the Dead Sea, an idea promulgated by scholars of the 1900's and left unchallenged. I can also add that I was told in Sunday School that Sodom was under the Dead Sea, an idea that is being pursued by an underwater research team which is wasting thousands of dollars if Collins is right.